He may not have “looked” impressive, but his performances turned heads in college. When he finished his career as a Wide Receiver for the Georgia Bulldogs, Ward’s receptions and yardage placed him second in school history. Which is even more remarkable when you learn that he spent his Freshmen year as a Running Back, and his Sophomore year as a Quarterback. Most of us are unaware that Hines Ward holds Georgia’s Bowl records for pass attempts, pass completions, and passing yards for his performance in the 1995 Peach Bowl. What makes these things even more impressive is that it wasn’t until after college that it was discovered that Ward accomplished all of these things while missing a ligament in his left knee, something that appears to have been lost during a childhood bicycle accident. Ward is smart, receiving his degree in consumer economics from UG. Ward is tough, he became known as much for his blocking as his receiving skills. Ward is fun, an unfading smile on his face proof that he loves to play. Beyond this, Ward was good. He holds franchise records with 1,000 catches, 12,083 yards and 85 receiving touchdowns and played an integral role in lifting Pittsburgh to three AFC championships and a pair of Super Bowl wins. 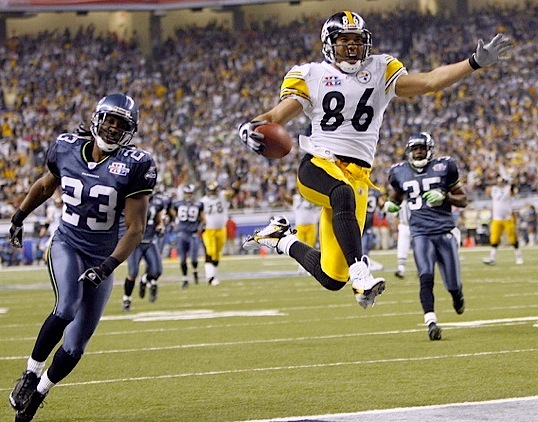 So why, After 14 years, is Hines Ward no longer a Steeler? The answer to this lies in the fact that Hines Ward, at 35, is too old and expensive for his contract. Last year Ward posted the lowest numbers since his rookie year and the Steelers now have two young receivers who made the Pro-Bowl. It’s been apparent for quite some time that this would be Ward’s last year with the only pro team he’s ever played for. The Steelers other receivers have expressed gratefulness for Ward’s professionalism and tutelage and while his teammates don’t want him to move on they also understand that the Steelers will not be successful if new talent doesn’t take the field. Which takes me from sports and into everyday life. Every organization has to come to grips with the fact that long-term viability isn’t just produced by the personal transfer of information, but also the transfer of responsibility and authority. For a business, school, or church to live beyond its first generation, first generation leadership must recognize the need to turn over the mantle of power to the second, and trust that the second will also repeat the process. This equation is as true for families looking to raise children into adults as it is in corporations looking to turn interns into executives. The transfer of information through teaching is the easiest portion, because leaders know a lot and they look to prove it on a daily basis. As a Youth Pastor I loved to teach my interns and associates because I felt it was a demonstration of my intelligence. The problem came when I realized that I needed to give them responsibilities. This meant that I was actually going to be losing duties. At first I had them gassing up vans and inflating balloons… things I didn’t want to do myself. When I realized that they had no outlet for their received information, I was faced with the reality that I was going to have to give up something that mattered to me. I had to actually let them pastor kids. When I finally gave them some real responsibilities, leading worship and small groups, I was somewhat surprised by how easily they put the accumulated information into practice. That’s what earned them authority. I never told a teenager that Chris or Andy or Amy or Becca was their leader. The kids just recognized it. They handed authority over their lives to the people who were willing to take responsibility for them. The teenagers were better at giving out authority than I was. As great as it was that I had given them information and responsibility, and that they had earned authority, there was one last thing that I had to learn about transferring power to the next generation. The fact that the buck stops with you. When I realized this, I knew that I had to step away. I’ve done this several times as a pastor, and in each situation I realized very late in the process that while I thought I was training new leaders, God was actually training me for what he had next for me. I’ve learned that you cannot transfer power without being humbled in the process… and I don’t like to be humbled. This is why it’s so hard for a leader, especially when they still have gas left in their tank, to recognize that it’s time to step away from the old and into something new. While I still had enough gas in my tank to get there. He called me away by showing me that helping to shape new Youth Pastors was infinitely more effective and satisfying than just being one. It just took me being willing to step away to create another one. When I was twenty, my “life’s dream” was to be the best Youth Pastor I could possibly be. I achieved my “life’s dream” by the time I was 35. Instead of being proud, I was lost. God confronted me with the fact that a “life dream” that could be accomplished in only 15 years was petty, pitiful, and small. And He loved me enough to call me to something new while I still had gas in the tank. If a 35 year-old Hines Ward plays football next season it will be for a new team, and that won’t be a bad thing. If that same 35 year-old man goes on to live the rest of his life without playing another snap in the NFL, it won’t be a tragedy either. Talent will have been developed. Dreams will have come true. Power will have been passed. And new dreams will be launched. I hope Peyton Manning is watching. Loved watching him play back in the day, #19 filling in as QB for the Georgia Bulldogs. While he played out of position, he dominated the game by giving the ball away to others, totally putting the team before himself.